I Work for Kids: A Great Resource to add to Your Outdoor Classroom Environment! A Blog for fellow Parents and Early Childhood Professionals. The purpose of this site is to share and collaborate with one another. We all work hard to make life fulfilling for children, and the more we share with one another the better we can be! A Great Resource to add to Your Outdoor Classroom Environment! I am a big advocate for getting kids in schools outdoors. Rain or shine children love to be outside! Problem is many teachers do not want to be outside; for reasons such as weather, or boredom. If teachers would learn to appreciate the importance on being outside, then the quality of our schools would greatly improve. Many ECE professionals think that they do not have the space or the money to create an inviting place outdoors for children. But the fact of the matter is children just love being outdoors. There are many components that you can add to your outdoor space and the costs are minimal. Water!!!!! Water is something that is a great inspiration to get kids excited about the outdoors. By bringing some of the same items from indoors into the outdoors it can add a whole new perspective. For example by bringing paint outside it allows children the opportunity to use there natural surroundings as inspiration. Another idea is by bringing outside manipulative's and placing them somewhere inviting like under a tree or next to a garden. It is up to each teacher to explore and create a space that promotes imaginary and creative play. It is always a great idea to visit other ECE professional websites and blogs for idea's. I believe that is why we all create these blogs so that we can resource and network with one another all in the name of children and for the love of the profession. Nature Explore is a great resource for not only natural materials, but for workshops as well. The CEC are huge advocates and pioneers in the Outdoor Classroom. Thanks for the great links! 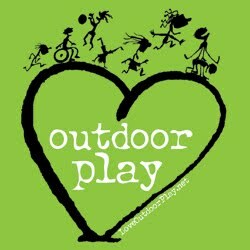 I'm always looking for more info on outdoor classrooms!